The Exclusive Monthly MarketWatch Newsletters are available to fit any budget. Find out how easy it is to produce your own Monthly Newsletter by selecting on the newsletter options on this page. 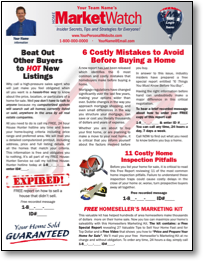 The Traditional 2 page newsletter is the best place to start. It is your easiest option. Producing any of these Newsletters will take only minutes of your time each month. 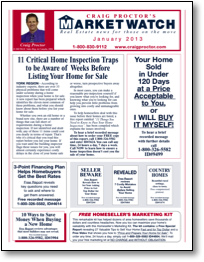 For the past 2 years I’ve been a part of the monthly Market Watch Newsletter program. I’m very happy with the product quality and personal service. I would recommend to all Craig Proctor members to take advantage of BXL Printers seamless system. Their products are tested and the service is excellent. Black & White printed, folded and bundled ready for distribution. Blue & Red printed, folded and bundled ready for distribution. Full colour printable PDF for you to print in your own office or with your own local printer. You will also receive two jpg files which can be emailed if you prefer. Since 2006 BXL Printers has been taking care of my printing needs. Fast, efficient, hassle free is what comes to mind. Yes everyone has a local printer that they could go to, but my marketing is specific to the Craig Proctor Quantum Leap System. By the time the printer does the set-ups and all the changes the cost becomes cost prohibitive. With BXL Printers it gets done right the first time. Thanks BXL Printers for a decade of great service. This personalized newsletter features even more of the information your prospects are looking for. A local Market Activity Chart on page 2 allows you to provide detailed information on the real estate trends in up to 6 areas in your sales territory. For the past year now I have been using BXL Printers for the monthly newsletter program. They make it so easy! It’s a great follow up to my post cards. 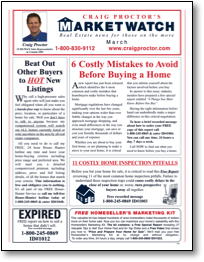 I highly recommend Craig Proctor members take advantage of this no hassle newsletter program. This version of the MarketWatch newsletter has all the same great information as the traditional newsletter packaged in a new format. Full colour, printed, folded, bundled and delivered directly to your door for you to distribute. I’ve been using Lynn and BXL Printers for about a year now. They take care of my printing needs from post cards to newsletters and the cost is very competitive. It’s no wonder why Craig endorses them for all his coaching members. Tuscany Real Estate Services, Inc.